Juxtaposition. Taxis, concrete, Picassos, glass, bagles, steel, tie-die, furs, martinis, brownstones, loafers, taxis, reubens, Birkenstocks, old fashioneds, hipsters, bankers, doormen, pinot (you pick it), concrete, truffles, neon, Van Gohs, parks, markets, bikes, flowers, taxis, overcoats, plastic bottles of Budweiser, tapas, joggers, beggars, concrete, skyscrapers (modern), skyscrapers (post-modern), skyscrapers (gothic), Wayfarers, Southern Rock, Warhols. Notice a pattern? 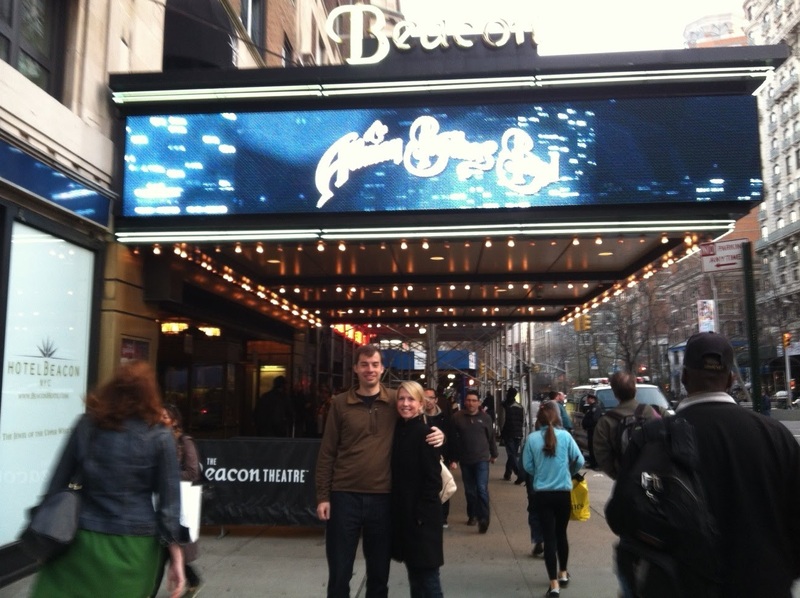 That's what makes the anachronism that is the Allman Brothers Band's annual residency at the Beacon Theater so special. It is charmingly out of place. When you close your eyes and listen to a gritty '70 version of "Statesboro Blues" ("I'm goin' to the country ...") a $10 bottle of Heineken is not the first thing that comes to mind. You don't see many Harleys in New York. I'm not sure how the Beacon run started (in 1999) or how it has survived, but it is one quirky tradition. I checked off a decade-old bucket list item when Cress and I went this year on March 17. The Beacon. For someone expecting the Fox Theater North, the first thing that strikes you about the Beacon (on Broadway, between 74th and 75th) is its size. Designed as an early motion picture and vaudeville house and opened in 1929, like so much in New York, it's intimate. The seats that my friend John Lyndon had been so kind to line us up with were perhaps 120 feet from the stage but 50 feet from the back wall. (Close quarters are automatically a good thing at any concert worth attending.) It's also ornate; a recent restoration brought it back to its original glory. It's something to behold. Per Wikipedia, "[t]he Beacon's ornate neo-Grecian interior features thirty-foot-tall Greek goddesses flanking the proscenium arch of its curtainless stage, which can rise from its basement level carrying a full classical orchestra." I don't have enough architectural vocabulary to do it more justice, but this was the view from our seats. Revival and Relevancy. No man (not even Keith Richards) is immune to the drag of time. Contrary to the refrain of the night's opener, the road does not go on forever for a Rock band. It's a finite thing. The Allman Brothers are no exception. Following Barry Oakley's untimely death (yes, motorcycle accident in Macon) in 1972, the band was steadily sapped of its vitality as drugs, alcohol, and dissension took their inevitable toll. By 1982, they were done. While a reunion was inevitable, there were two directions it could take. One would have found a couple of the original members performing with a supporting cast of no-names on the Southeastern casino circuit under a banner that lost its true meaning long ago (the pure commercial sell-out). Instead, they chose the High Road. They put themselves back to together and did the hard work that is necessary to remain relevant after decades in the business. They reinvented themselves. Beginning with the introduction of Warren Haynes, Allen Woody, and Mark Quinones in 1989, the band fused explosive young talent with the four remaining original members (Gregg Allman, Dickey Betts, Jaimone, and Butch Trucks) to exhilirating effect. The real evolution came with the dismissal of Dickey Betts (sniff sniff; but for the better) and the introduction of then guitar prodigy Derek Trucks in 2000. That began a period of rebirth that saw them dig back into their catalog and re-invent their classics while unveiling a seemingly endless catalog of new covers ranging from Derek & the Dominoes to Dr. John to John Coltrane. A musically-vital project now more than a decade old has resulted. Music people are motivated to go and see this band today not because of what they are playing, but how they play it. (Could the same be said for an Eagles reunion crowd or a modern Jimmy Buffet audience). While every ABB crowd is inevitably sprinkled with Decade of Hits devotees waiting for a "Rambling Man" that will never come, the bulk of the people there are real music fans genuinely interested and invigorated by what is happening on the stage. (It's the way I console myself over Duane Allman's untimely death. As great as he was, would he have followed the same course of self-destruction that pushed Jerry Garcia out of musical relevancy in his later years? At the ripe old age of 65, would he still have the volcanic fire that Derek Trucks puts out night after night? Not likely. As a matter of pure music history, it's better for the artist to be gone early than to wither for years in irrelevancy. I'll still never get over it.) Thus, Cress and I ducked out of the chaos of the Broadway sidewalk into the Beacon about 8:00 p.m. The Show. For a Southerner with an affinity for Rock, the Allmans are the home team. They are tied inevitably to the history of Our State like the '91 Braves. Thus, it's hard for me to write about them objectively. What I can tell you is that they are still capable of powerful performance, but they are decidedly older than they were even five years ago. Like an aging quarterback trying to will his aching knees to carry him to one more win, the original ABB members now rely more on the supporting cast. That's not a bad thing. (If you like to hear electric guitar and have never seen Derek Trucks and Warren Haynes share a stage, do yourself a favor.) It seems like Gregg hands a couple more songs a show off to Warren on vocals these days and sits out the instrumentals more. Jaimone is looking a little frail (though I hear his playing past 2:00 a.m. at the post-show party this night was anything but), and I hear Butch Trucks's shoulder is going out on him. Derek and Warren are the focus now, as they should be. Still, this is a band I would rank in my top 5 to see live, on the merits. The March 17 Beacon show was a case in point. For a scholar of the genre, the recorded Bill Graham introduction was a goosebumps moment. Coupled with the 40th anniversary of the release of Eat a Peach, it gave the night historical context. Keeping with the theme was a rare "Midnight Rider" opener. (This is the first ABB song that I remember associating with the band. I think it was on a beer commercial that ran about '89; hot girl walking into a dusty bar in the middle of the desert and throwing a coin in the jukebox.) The song is not a platform for extended solos, so it's not on my shortlist for a modern ABB set. On this Saturday night, it worked perfectly as an opener. If there was a 16 oz Stella in the house below shoulder level by the end of the first chorus, I didn't see it. Things then got hot. Early. "Trouble No More" is a perfect example of a classic that Derek Trucks has set afire. His completely atypical no-pick cackling demon slide style is perfect for "Trouble," and my jaw was firmly clenched by the end. Before he launches into the solo on this one, you can just hear his SG straining at its reins. It's strong sauce. There was no rest for the weary. Having been relatively "quiet," by Guitar legend standards thus far, Warren Haynes took over for the slow Elmore James twelve-bar classic, "The Sky is Crying." Warren's style is powerful, but more precise and in the classical blues vein than Derek's. Warren's body may have been born in Asheville, but his soul was born on the Delta. Like Garcia (albeit with a harder edge), the man can play everything more competently than 99.5% of the world's guitarists can play anything. There's not a song he's afraid to tackle (as we saw later), but old, dirty Blues is right in his wheelhouse. Rock has no more honest, hardworking ambassador than Warren Haynes. He is the standing Godfather of what we call "jam." From there, the set stayed on the slow end of the metronome, with the very-new "Egypt" and an unexceptional version of the slow jazzy "Desdemona" that put everyone in their seats for the first time of the night. (Not because anyone was bored; it's just a sign of a 30-60 year old crowd.) The Willie Dixon/Muddy Waters standard, "Hoochie Coochie Man" offered what could have been a set-closing high point. On this night, they gave it a slow tempo intro (think "Mannish Boy" slow) that spilled a little awkwardly into their more traditional arrangement. I thought it fell a little flat. Historical sidenote: The band will never play a better version of this song than the 7/3/70 Atlanta International Pop Festival version. A new evolution at the Beacon this year is an acoustic mini-set after the break. The run is always known for eclectic and rare covers (e.g., starting this year with an interpretation of Rogers & Hammerstein's "A Few of My Favorite Things") and big ticket guest appearances. While Randall Bramblett (sax) and Bruce Katz (keys) contributed to the first set, coming out of the break, we were due for a big-time cover. Warren and Gregg took the stage for a mellow version of Jackson Browne's "These Days" (previously unknown to me). A bit of precussion was added for "The Dark End of the Street" (most popular as performed by the Flying Burrito Brothers/Graham Parsons). All in all, a slow start. In hindsight, they were saving up. History followed. Darkness fell on the stage post-"Dark End." With the lights came the ethereal presence of Grace Potter. After introductions, the band moved patiently into a mystifying cover of Fleetwood Mack's "Golddust Woman." ("Did she make you cry, make you break down, shatter your illusions of love!?") I've always been a Fleetwood basher. Nevermore. Beyond giving Fleetwood a measure of credibility in my mind, the eight minutes that followed left no doubt that Grace Potter is a Presence. This was a Moment she'd obviously waited for, and she knocked it out of the park. If the crowd seemed quiet, it's because most of them were staring at her, mouth agape, enchanted as she moved around the stage like a hippie shaman in a trance. It was unforgettable. I noticed Warren screaming commands at the band towards the end of "Golddust" and Grace stayed on the stage. Anticipation. Once the electric instruments were handed back out, the band launched into screaming version of Neil Young's "Southern Man." Yes! Yes! "Waaaaareeeeeeeeennnnnnnnn!!!!!" Everybody loves Neil. (If your notion of him is that of a South basher warring with Ronnie Van Sant over her honor, hear the Drive By Truckers' side of this. It's not that simple.) Going back to our theme of juxtaposition, hearing the Long Islanders standing next to us (the guy to Cress's left had on skinny-leg acid wash jeans with '89 vintage black Reebok high tops and a mane of silver hair straight out of Wayne's World; you can't make this up; no, he wasn't trying to be funny) scream the lyrics while listening to Southern legends play an ornate theater on Broadway was apropos. It was an invigorating 12 minutes, frozen in time for me. Historical sidenote: What you see in that video is the first time in the 40 year plus history of the Allman Brothers Band that a song has been played on a stage with zero members of the original band present. Once a venue is as overheated as the Beacon was after "Southern Man," the next step is always hard. The air really didn't get back in the sail until later in the set when they brought bassist Oteil Burbridge up for Hendrix's "Manic Depression." For the helpless Jerry fans in the audience (me included), an up-tempo version of Little Milton's R&B thumper "That's What Love Will Make You Do" was the late-show highlight. The peak saw Trucks, Haynes, jazz guitarist Jeff Acheson, and Bramblett repeatedly passing solos down a line like a possessed IBM Selectric. The recently revived "Jessica" brought the second set to a rousing close. Gregg reminded the audience that he could still blow on a clipped "One Way Out" encore (too short for encore duty IMO), and up came the lights. With smiles on our faces and ringing in our ears, Cress and I took the long walk back down Broadway in the brisk night air. I want to say a special thanks to John Lyndon for putting the night together. For years now, he has devoted hours and hours of his time and lent his (deep) connections to the band to make as many tickets as he can available to anyone who expresses a desire to go. If only I knew the number of smiles that he's created in the process. Thanks, John.